Upper D. The unsuccessful self-treatment of a case of "Writers Block." Journal of Applied Behavior Analysis. 1974;7(3):497. Didden R, Sigafoos J, O'Reilly MF, et al. A multisite cross-cultural replication of Upper's (1974) unsuccessful self-treatment of writer's block." Journal of Applied Behavior Analysis. 2007;40(4):773. The results were... staggering. Some of the most rigorous and damning results if I ever saw. So humour aside, I struggle with writer's block often. I have been advised to go and get a stiff drink at times, others have said if I stare hard enough at the keyboard and screen the words will come to me, or the soul of music will inspire me as my muse. I cannot say these have all been effective. Often times I take a break and read something well outside of the area I am writing about, or some non-fiction to get my mind boiling. Some other aspects I have picked up include drawing my thoughts or writing by hand what I want to say. For some odd reason, I like to use a fountain pen, and keep some stationary notebooks for this purpose. I find the act of writing in such a manner to concentrate my mind not so much on the content but what I am doing. At times I wonder if its a self-reflective meditative stance of mindfulness whereby I can put myself at ease. A recent software application I came across on my Mac is OmmWriter, though it also available as an app on the iPad. However, I really never have enjoyed the aspect of longterm writing on on such a device. 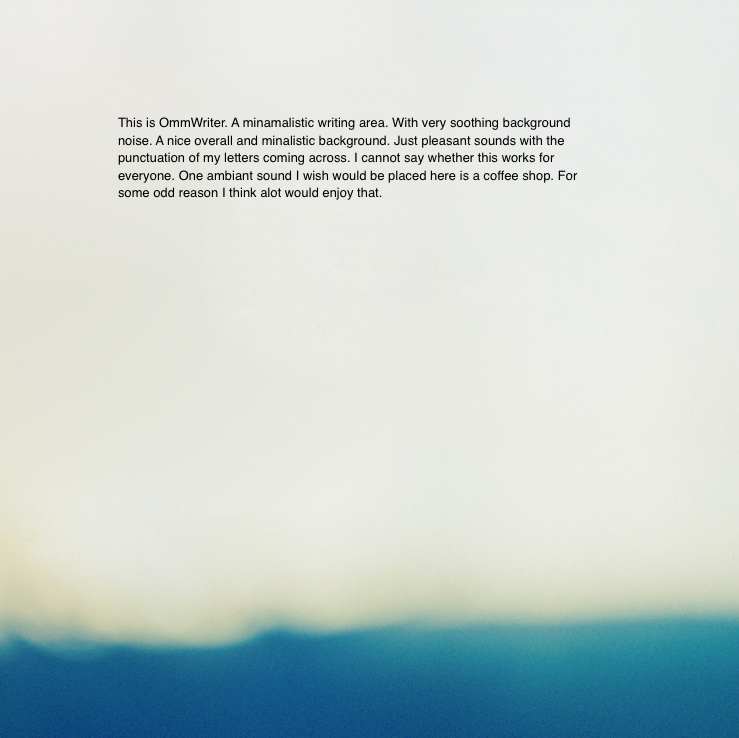 OmmWriter places the user on a minimalistic screen where there is a simple backdrop, ambient noises/music, and the ability to choose sounds for the clatter of their typing. It is quite soothing, though I think the purpose to center the user on writing for itself, may not be the best for some academics using online references and notes dotted across the rest of their screen. As such, I find it useful for the introduction and discussion component, but not the technical side of a manuscript.